It is the mid 1980s, and I am 27 years old. For the last six years, I’ve been selling my handmade soft sculptures on the street, at state fairs, and eventually, in a retail store. I’ve been learning how to create products people want. But it’s still been a tough way to make a living. And I’m beginning to feel like I may have hit rock bottom. My friends and family have begun to side-eye me. In their eyes, it’s time for me to grow up -- time to get with the program, time to get a “real” job. They are very kind, but I can tell they think I’m a loser. They have good jobs and they’re getting married and buying houses. I’m chasing my dream. At the moment, I also happen to be sleeping on a friend’s couch and my car has just broken down. They couldn’t envision how my future was going to turn out, but I had faith. I knew my path was never going to be as straight as theirs. I believed deep down that what I was learning would be important later on. I felt sure of one thing: If I could create a living working with my hands, I’d be the richest man in the world. In my eyes, I was simply experiencing a bump in the road -- a small detour. We all hit rock bottom, don’t we? Thankfully, I met someone who believed in me. Susan thought I was talented. She saw something in me that others could not. She let me live with her so that I could start over, and for that I will never be able to thank her enough. Susan’s apartment in Fremont was brimming with stuffed animals. She had teddy bears of all different sizes as well as farm animals like cows and sheep. She loved the soft sculptures I had created and collected those as well. One day, Susan asked if I could design a bear. I told her no, I wasn’t a patternmaker -- all soft sculpture was done by hand. “Try,” she implored. So I did. I started studying the dimensions of one of her teddy bears. I needed to teach myself how pattern pieces could be sewn together to create 3-D objects. I took its measurements. Then I reached for paper, started cutting shapes out of it, and began taping them together. It struck me that I could just as easily sculpt in paper. Inspired, I quickly moved on to color construction paper and built a fish modeled after the character Cleo, the goldfish in Pinocchio. To my delight, it looked absolutely amazing! I stuffed it with paper tissue to give it more dimension. Later that day, Susan took apart the fish and laid out the pieces of paper I had used to create it on shimmering fabric. Together, we created the first plush animal I had ever designed. I was hooked. My world changed that day. Companies had been selling plush animals forever, and all of a sudden, I had a marketable skill. For the next month, I created paper sculptures of everything from ducks to dogs to bears -- you name it. Working with paper was extremely satisfying, because it was so forgiving. If I made a mistake, well, I could simply keep trimming and then tape the pieces together again to get closer to the right shape. I could shape, cut, tape, reshape, cut again and tape over and over again. I was working with my hands, and I loved being able to transform an idea into a product so quickly. It was magical. One day, Susan suggested that I contact Dakin, one of the largest and oldest producers of plush animals. Conveniently, the company was located just across the San Francisco Bay. To my surprise, when I picked up the phone and asked if they needed any freelance work done, they invited me to come in right away. I can remember taking the elevator to the top floor, somewhat in awe. I brought a few photographs of my work along. They’re weren’t much, but they must have been good enough, because they handed me a swath of fabric and told me I had two weeks to design a life-size realistic-looking golden retriever. When a door opens, stick your foot inside. For me, "fake it ‘til you make it" has always been a bit of a motto. Had I ever designed anything like a life-size realistic-looking golden retriever before? No. But I took a chance. First, I started studying the structure of a golden retriever. Then I went to the library to make life-size Xerox copies. Next it was time to starting cutting paper and taping it together. If I could make the dog look good in paper, I knew it would look good in fabric. And there it was: A beautiful life-size plush version of America’s favorite dog. 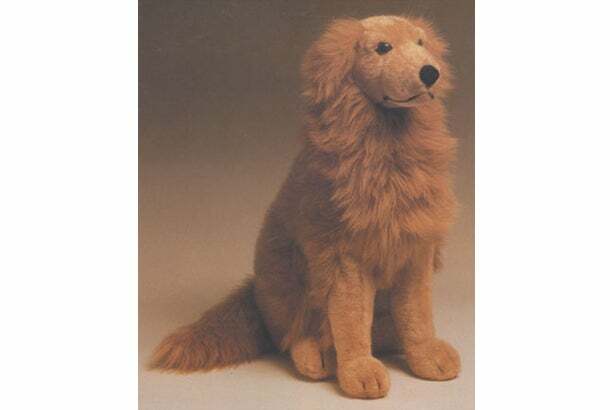 A golden retriever plush named Sandy made by Stephen Key for Dakin. Dakin couldn’t believe how good it looked either. When I held the $1,500 check they handed me, I grinned. Having the courage to make a change is a fundamental part of being an entrepreneur. What my friends and family didn’t understand is that I had realized my handmade soft sculptures could never be mass-produced. I didn’t want to keep selling my ideas on street corners -- I wanted to grow my audience. So I needed to learn about manufacturing techniques. I needed to reevaluate where I had been in order to move on. Dakin mass-produced my Golden Retriever, which the company named Sandy. The following February, I flew to New York for Toy Fair. After the show, I stopped by FAO Schwarz, the oldest toy store in the U.S. It was cold and rainy. Inside, there was Sandy.